Oregon State University get academic about craft beer with their new Oregon Hops & Brewing Archives. With over 200 breweries, Oregon is often considered the craft beer capital of America. Beer geeks and casual drinkers across the country can thank the state’s farmers for their brews. Hops, the essential ingredient that gives beer its bitter flavor, is a rare crop throughout the U.S., but not in Oregon. The state has a long history of growing hops thanks to a climate perfectly suited to the plant. And Tiah Edmunson-Morton, the archivist in charge of OHBA, wants to shine a spotlight on that history. With over 200 breweries, Oregon is often considered the craft beer capital of America. 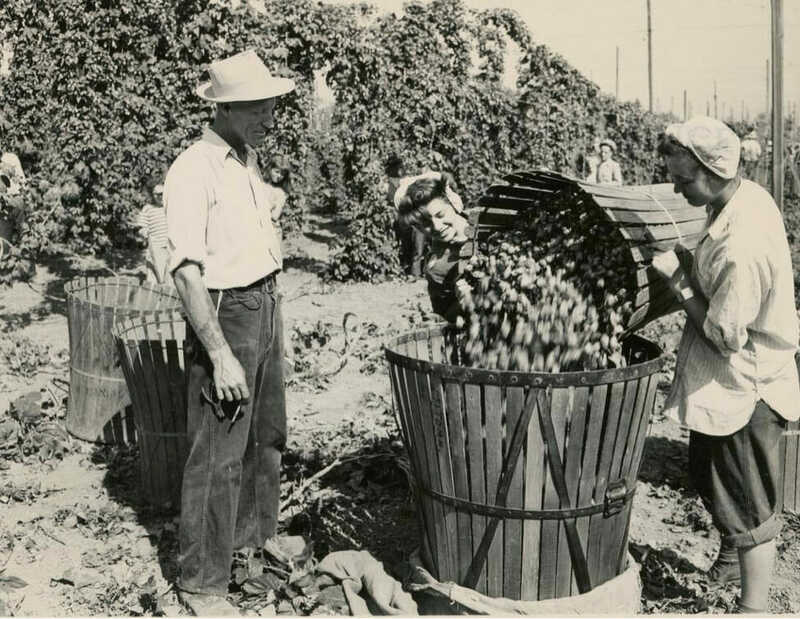 Just nine months into the job, Edmunson-Morton has already collected a variety of materials for the archives, including craft beer posters, hops breeding reports and historic photographs. 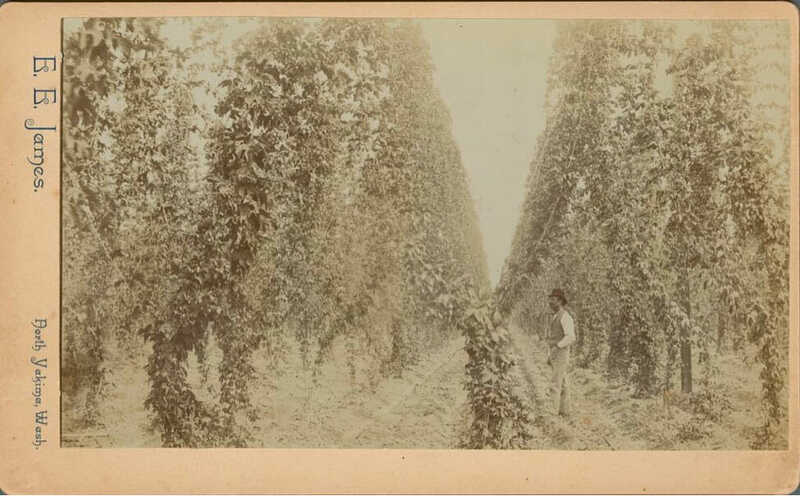 OHBA’s extensive Flickr and Zotero collections enable people to easily tap into beer and hops history with a few clicks. Acquiring a keg might just be another Friday afternoon chore for a frat boy, but for Edmunson-Morton, it’s part of her job. She recently brought back a cask from McMenamins, an Oregon chain of craft brew pubs. Unfortunately, OHBA’s home on the top floor the Oregon State University Library is not big enough to house multiple casks, kegs, or other large brewing equipment. Edmunson-Morton is looking into using 3-D photography to document other large artifacts. She’s also taken OHBA’s mission outside the physical walls of the archive, hosting brewery tours, tastings and even film screenings. Despite the limited space ”“ and the irony of mixing beer and studying ”“ this is a most fitting place to preserve Oregon’s brewing history. Oregon State University has experimented with hops in its research fields since the 1890s. Its Aroma Hops Breeding Program developed some of the nation’s most popular hop cultivars such as Cascade and Willamette, and continues to breed new ones for the craft brew industry. With a brewhouse on campus and several courses on brewing techniques and analysis, the school can also boast that its students don’t just drink beer; they brew it too. With a brewhouse on campus and several courses on brewing techniques and analysis, the school can also boast that its students don’t just drink beer; they brew it too. In fact, Oregon State is one of only a handful in the nation with a Fermentation Science program. Its graduates have started ciderhouses, crafted new beer varieties and taken jobs with beer behemoths such as Anheuser-Busch. OHBA chronicles the work of these programs, bringing together decades of hops and beer research. But its greatest value may be to serve as a one-stop shop for historians and beer nerds alike. At OHBA’s recent launch party at the McMenamins Mission Theater in Portland, Peter Kopp, a self-described hops historian and author of the forthcoming book “Hoptopia: Agriculture, Beer, and Place in Oregon’s Willamette Valley”, explained why people need OHBA. “We live in an important moment. In 100 years, people will ask why did the craft beer movement happen,” he says. OHBA would have been a boon to Kopp when he was first researching hops. He had to crisscross Oregon’s Willamette Valley, visiting historical societies, libraries and breweries. In this valley brimming with hops and brewpubs, there was no central place to research their history. 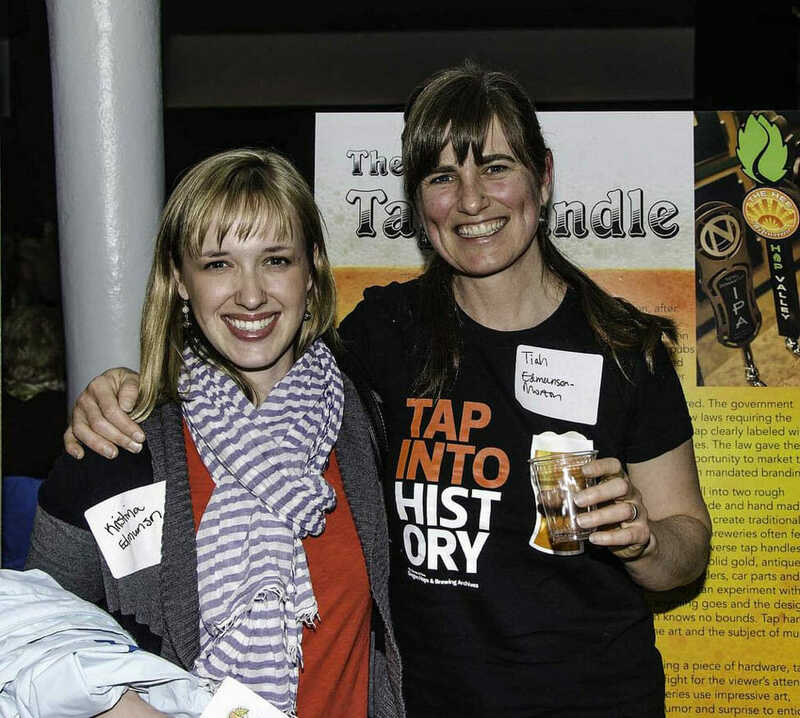 OHBA Archivist Tiah Edmunson-Morton at the OHBA's launch party with sister Kristina, March 28. Courtesy of Oregon Hops and Brewing Archives. 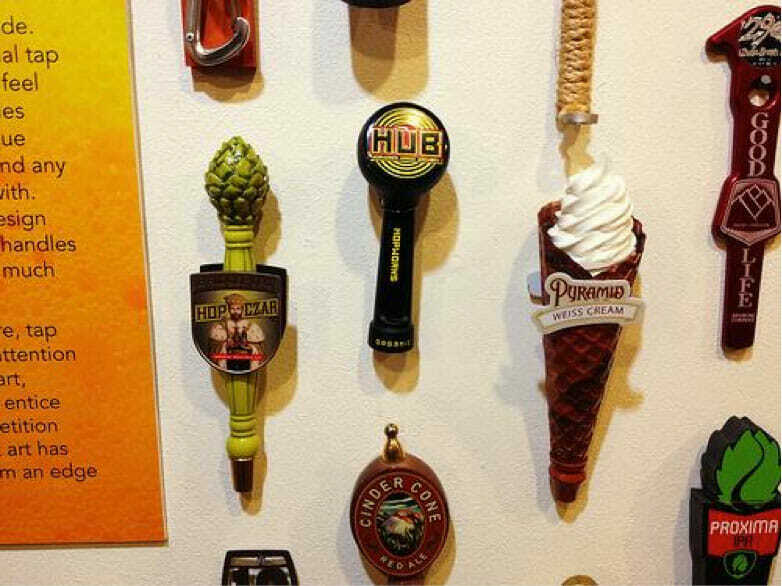 A wide collection of bottles and tap handles in Springfield, Oregon's exhibition, 'Behind the Label: The Art of Oregon's Craft Brewers.' Courtesy of Oregon Hops and Brewing Archives. Hop yard of W.E. Thornton in Yakima, WA, Circa 1920s. From the E. E. Wilson Photographic Collection. Orren Goff, check boss, watches Janiece Gerhard, 15, and Jorene Johnson, 17, dump a basket of hops into a hopper in preparation for sacking and weighing, 1946. From the Extension and Experiment Station Communications Photograph Collection. 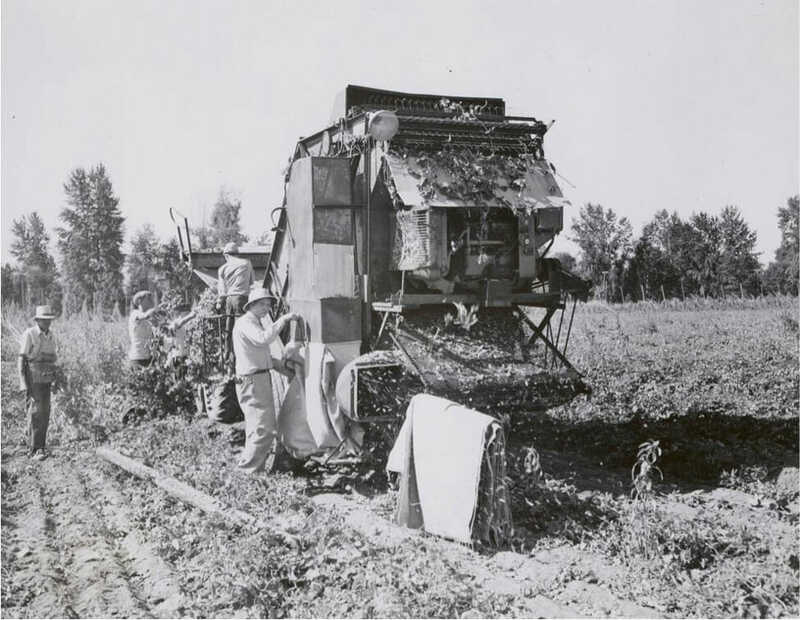 Harvesting hops by portable machine, circa 1930s. From the Extension Bulletin Illustrations Photograph Collection. Courtesy of Oregon Hops and Brewing Archives. Today, Oregon remains one of the top hop-growing areas in the world. One in three beers contain hops from Oregon, Washington or Idaho. One in three beers contain hops from Oregon, Washington or Idaho. Edmunson-Morton frequently meets with such brewers, not only collecting documents and photos for OHBA, but also recording their personal histories. Some brewers are even growing their own. Ben and Nathan Tilley, founders of Agrarian Ales in Eugene, Oregon decided to plant 10 varieties of hops on their family farm after discovering that the same land had produced hops in the early 1900s. Now, they aim to grow nearly all the hops and barley that goes into their beers. Larger craft breweries have caught wind. After expanding sales across the nation, Rogue Brewery bought a hop yard in Independence, Oregon. 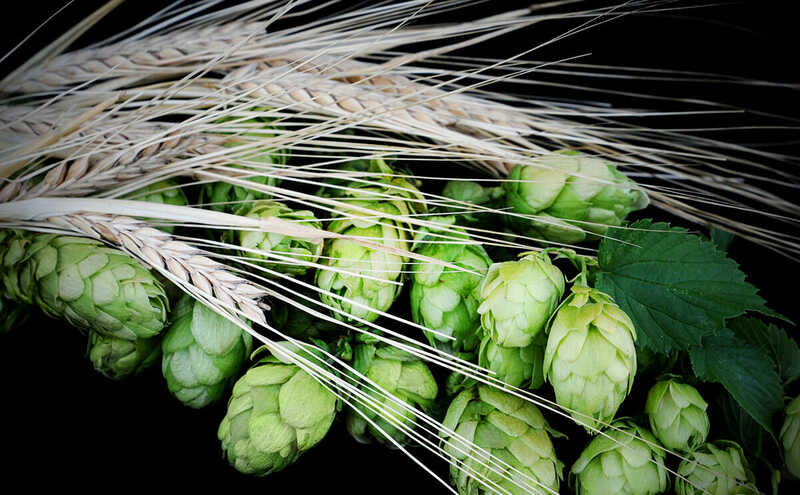 The farm now grows hops, rye, barley and other ingredients for a line of Rogue Farms beers. However, Edmunson-Morton doubts this trend will make history. “Hops is something very expensive to get into,” she says, one of the reasons that small hop yards disappeared in the first place. Scores of Oregonians grow one or two hop plants up the side of their house, but brewers don’t want to take on the risk of growing entire fields of hops. Instead, they are working more closely than ever with hop growers to get the varieties they need, says Edmunson-Morton. For example, some brewers are requesting that hop yards grow Meridian, a rare hop variety developed in 2011 that imbues beer with a particular fruitiness. It’s anyone’s guess what the future holds for hops growers in Oregon. One thing is certain though. Never again will beer lovers have to go to great lengths to uncover the rich history of the hops region. They can just pop over to the OHBA. But they will have to wait a crack a cold one until after leaving the library. Some things never change.